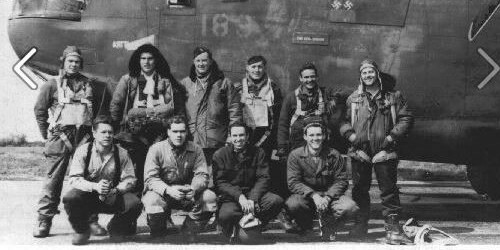 “Our group of 26 B-24s — each loaded with four 2,000-pound bombs — was to join hundreds of other bombers and fighters from the 8th Air Force on the mission. Our aircraft’s load included a couple of 100-pound smoke bombs because, as lead, our formation dropped on our release and the smoke bombs acted as a marker. “All was well until our crew chief found an engine problem that couldn’t be fixed in time for take‑off. Therefore, we had to use a backup aircraft. Time was moving rapidly toward mission take‑off time and we had a new bird to pre-flight. We immediately encountered a problem in that the spare’s bomb load wasn’t correct and had to be downloaded and replaced in the dark and rain well before sunrise. “The download/upload of bombs took darn near every bit of the time remaining and we were pressed to man-up, crank up the four engines and get to the runway to lead the takeoff sequence. “As usual, the weather was lousy. A ragged 600 foot ceiling, moderate rain and solid clouds from 1,800 to 20,000 feet. We had specified climb corridors and routes since there were several nearby bomber and fighter groups executing similar departures. 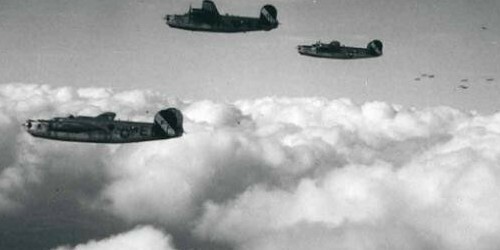 “The plan was for each of the 25 B-24s following us from Old Buck to penetrate the clouds individually and — once on top — rendezvous with us via the Buncher 6 radio beacon. We would then join with other groups to form the Division as we departed the English coast for Germany. “By that time it would be daylight and we knew German flak would begin right away — prior to crossing the coast inland — from flak barges and would continue in varying intensity and accuracy until we re-crossed the Channel on the way home. “We took the runway with the deputy-lead on the right wing. I applied power and we rolled slowly down the runway, heavy with full fuel and the bomb load. I eased the B‑24 off the ground and called for the gear retraction. Checking the instruments, I found — with some trepidation — that we had no airspeed, erratic rate of climb and questionable altitude. There was no choice but to proceed and soon we were mired in thick cloud and rain. “Fortunately, the aircraft was flying well and we were climbing at a positive — if unknown — rate. Without the gauges we rely upon in zero visibility, I had no choice but to fly the aircraft by attitude, power and the seat of my pants. We needed to unscrew this ASAP, so I called for Chris, our flight engineer, to make his way up to the cockpit and explained the situation. “Given that our pitot-static system was totally defunct, we ran through the possibilities and quickly diagnosed the problem. In our hasty departure, the protective covers had to have been left on the tubes shutting off both the ram and static air sources needed by our gauges. “Problem was — even though we understood what went wrong — we still had to solve it because we needed both airspeed and altitude for bombing, to say nothing about normal flying and recovery, assuming we got home in one piece. “Running out of the proverbial airspeed, altitude and ideas, our solution was a bit drastic, but none other came to mind. As I kept us climbing wings level, Chris got his tool box, went up to the bombardier’s compartment and chiseled out a sizable hole in the side of the fuselage just ahead of where he knew the left-hand pitot tube to be. “He then reached out and pulled the cover off the pitot tube and — like magic — we had airspeed, altitude and rate of climb for the rest of the mission. “The hole was easily explained as battle damage since we had collected multiple holes from heavy flack and German fighters. But, to my knowledge, this specific bit of mission information never made it into the debriefing folder.